- 3 ways to unlock: Fingerprint+Password+Keys; suit for 3.3-6cm thick wooden doors. - The unique LED touch screen is scratch resistant and dust-free. The smart chip recognizes rapidly. - Anti theft，Lift up the door handle to lock the door. - Keypad Shutdown: 1 minites if a code is wrongly input 5 times. - Powered by 4x AA battery(not included). Come with emergency power supply, when power goes out, you can use it or just unlock the door with the key. 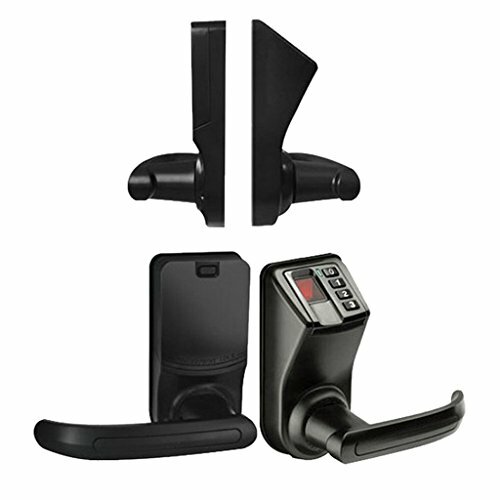 - Apply to more than 99% doors like wooden door, bronze door, stainless steel door, anti-theft door and so on. Fits for home, apartment, office, school, etc. - Freely change handle direction(Free handle). 3 ways to unlock: Fingerprint+Password+Keys; suit for 3.3-6cm thick wooden doors. The unique LED touch screen is scratch resistant and dust-free. The smart chip recognizes rapidly. Anti theft，Lift up the door handle to lock the door. Keypad Shutdown: 1 minites if a code is wrongly input 5 times. Powered by 4x AA battery(not included). Come with emergency power supply, when power goes out, you can use it or just unlock the door with the key. If you have any questions about this product by Blesiya, contact us by completing and submitting the form below. If you are looking for a specif part number, please include it with your message.